This creeping perennial is a long way from home. 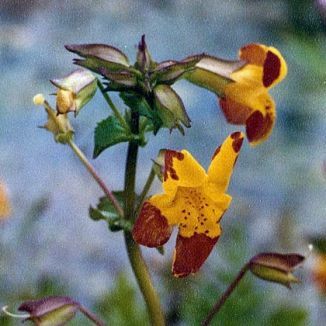 It came here in the 19th century, from N. America, to many gardens from which it has made its escape into the wild and hybridised with Mimulus guttatus (Monkeyflower). This plant is a creeping perennial which has erect, stout stems which bear three to seven yellow flowers in each leafy, stalked spike from June to September. The two-lipped flowers are 25-45mm across, with the open mouth, heavily blotched with red on the throat, being a perfect place for pollinating insects to land. This plant is found in wet places and belongs to the family Scrophulariaceae. I found this plant and photographed it at 5-mile point, Co Wicklow in 1978. In 1978, when I found this plant, I was unsure of its identification and contacted Miss M J P Scannell, Head of Herbarium at the National Botanic Gardens. 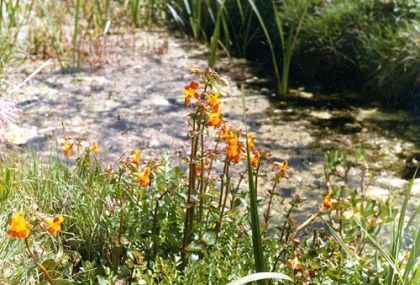 She told me she thought that this was possibly Mimulus luteus or Blood-drop-emlets or a hybrid between that species and Mimulus guttatus. Unfortunately a specimen of the actual plant would have been needed in order for a positive identification to be made and that was not possible at the time. I visited the Herbarium and met Miss Scannell and she was so extremely generous with her help and encouragement.